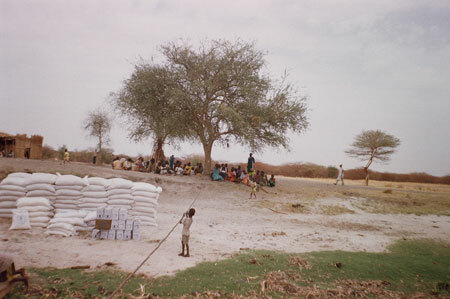 A village group meets in the shade of a tree on the riverbank, with unallocated supplies from the World Food Program visible on the shoreline below. Morton, Chris. "World Food Program supplies" Southern Sudan Project (in development). 03 Jan. 2006. Pitt Rivers Museum. <http://southernsudan.prm.ox.ac.uk/details/2007.137.5/>.